Pro-Tibet activists held a candlelight prayer vigil outside the Chinese Embassy in Canberra last night as the city prepares to host the troubled Olympic torch relay. A small crowd has gathered outside the embassy, just a few blocks from the route of the torch relay, and a low security presence is keeping protesters behind a fenced off area. 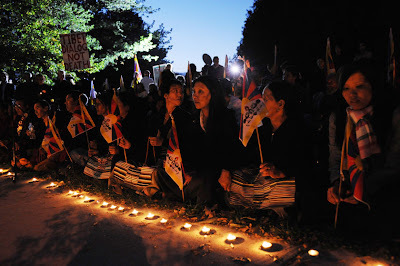 The demonstrators lit several hundred candles, some spelling out the phrase 'Free Tibet'. The Tibetan community is planning more action today as the flame is carried through the streets of the national capital. Protesters have been urged to demonstrate peacefully during today's torch relay and not to respond to any provocation by Chinese supporters.